Couples in their 20s had their heart rates and brains monitored whilst they first melted chocolate in their mouths and then kissed. Chocolate caused a more intense and longer lasting "buzz" than kissing, and doubled volunteers' heart rates. The research was carried out by Dr David Lewis, formerly of the University of Sussex, and now of the Mind Lab. Experts, concerned at growing levels of obesity throughout the developed world, warn that chocolate should only be consumed in moderation. Dr Lewis said: "There is no doubt that chocolate beats kissing hands down when it comes to providing a long-lasting body and brain buzz. "A buzz that, in many cases, lasted four times as long as the most passionate kiss." Although kissing set the heart pounding, the effect did not last as long as that seen with the chocolate, which increased heart rates from a resting rate of about 60 beats per minute to 140. The study also found that as the chocolate started melting, all regions of the brain received a boost far more intense and longer lasting than the excitement seen with kissing. Although women are generally thought to be bigger fans of chocolate than men, the research found the same reactions to chocolate in both sexes. Dr Lewis said: "These results really surprised and intrigued us. "While we fully expected chocolate- especially dark chocolate - to increase heart rates due to the fact it contains some highly stimulating substances, both the length of this increase together with the powerful effects it had on the mind were something none of us had anticipated." 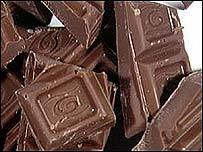 Psychologist Sue Wright said: "Chocolate contains phenylethylamine which can raise levels of endorphins, the pleasure-giving substances, in the brain. "It also contains caffeine which has a stimulatory effect on the brain. "This would explain why chocolate can give people a buzz, and why people can become addicted to it." The research used a new 60% cocoa dark chocolate from Cadbury, and a spokeswoman for the chocolate makers said: "You'd think people would be shy about kissing in a laboratory, but that wasn't the case at all. We're not talking about a quick peck here." The Mind Lab is funded by members of the food industry, although no firm can be linked to any individual study. The tests are not the accurate really because if i had the choice of kissing my partner or chocolate, I am sure the chocolate would win but if you gave me Al Pacino to kiss the results would be very different. In my opinion these scientists have underrated the effects...I'd say chocolate is probably at least 10 times better than any other known form of stimulation in existence. And the only thing better than a bar of chocolate is two bars of chocolate! Of course chocolate is better than kissing! It is guranteed to taste better every time - which, in my experience, is more than can be said for some passionate kisses! I can only draw 2 conclusions from that! They¿re not kissing the right person¿..OR...I SO want some of that chocolate if it¿s really true! From my experience kissing allways beats the chocolate bar, maybe Im choosing the wrong chocolate! Obviously none of them had kissed my gorgeous wife. Chocolates kinda makes me fat though - but kissing seems to help me lose weight. You will always remember your first kiss not your first chocolate. I don't know, a passionate kiss, vs. lovely dark chocolate . . . It depends who I"m kissing. There are kisses I can still remember, but I can't remember a single bar of chocolate, and I'm a choc-oholic! Well I am a girl and therefore a huge chocolate fan however recently I have found that I get a much bigger buzz from kissing my boyfriend, however this is a new relationship so that may be the reason why, after a few months I might have to resort back to chocolate!